Tony Award-nominated “Speed-the-Plow” is a biting satire of Hollywood. Charlie Fox has a terrific vehicle for a currently hot client. Bringing the script to his friend Bobby Gould, the newly appointed head of production at a major studio, both see the work as their ticket to the Big Time. The star wants to do it; as they prepare their pitch to the studio boss, Bobby wagers Charlie that he can seduce the temp/secretary. 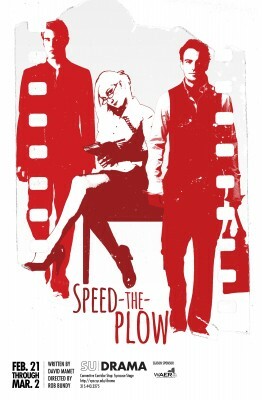 “Speed-the-Plow” will run Feb. 21-March 2 in the Storch Theater at the Syracuse Stage/SU Drama Complex. 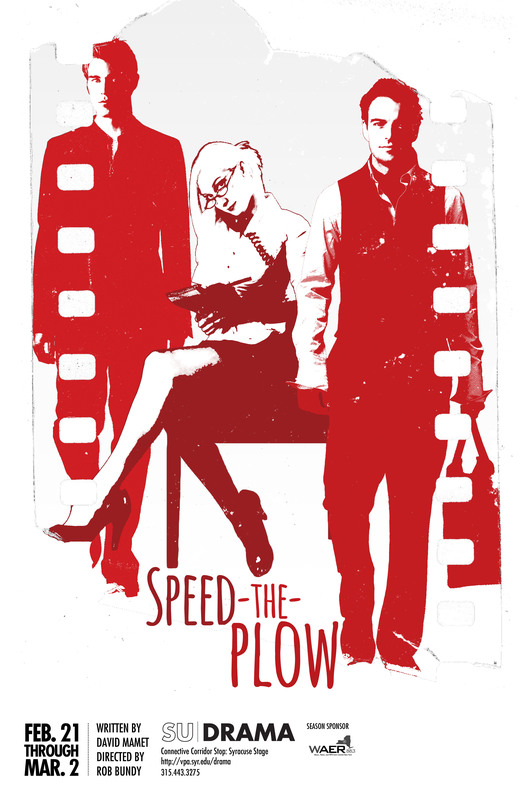 Tickets can be purchased online at http://vpa.syr.edu/drama, by phone at 315-443-3275 and in person at the SU Drama Box Office, 820 E. Genesee St.
“Speed-the-Plow” uses Hollywood as the backdrop for issues that run deep through American veins. From what constitutes art in an industry all about money, to the role of women in society, Mamet captures it all with his cynically funny, sharp-witted dialogue. In 1988, David Mamet wrote “Speed-the-Plow” in his well-known “Mamet Speak”—full of deliberately incomplete sentences, biting language and fast-paced quarrels that lead to deeper underlying societal concerns. It is his signature and has been since his first play in 1970. Mamet has written award-winning plays, screenplays and essays. His best-known theatrical pieces in addition to “Speed-the-Plow are “American Buffalo” (1975), “Glengarry Glen Ross” (1983), for which he won the Pulitzer Prize, “Race” (2009) and “The Anarchist” (2012). He has also written screenplays for movies, such as “The Verdict” (1982) and “The Untouchables” (1987). “Speed-the-Plow” premiered on Broadway in 1988 at the Royale Theatre. Ron Silver won the Tony Award for Best Actor as Fox, alongside Joe Mantegna as Gould and Madonna as Karen. The original production was nominated for Best Play and Best Direction of a Play. It was later revived on Broadway in 2008 (directed by Neil Pepe). Bundy was artistic director of Stages Repertory Theatre for 10 years (1996-2006), where he produced more than 100 plays and directed 30. Bundy has directed at numerous regional theaters and has taught and/or directed at numerous training programs nationwide.